The New Bern Grand Marina, A CRUISERS NET SPONSOR, lies in the heart of downtown New Bern, North Carolina, along Trent River’s northern banks between Trent River highway and railroad bridges. Hey Folks, as you know we’ve been fully occupied at the New Bern Grand Marina Yacht Club most of the winter season due to the fact that a number of locals and cruisers like to stay in New Bern for the mild and temperate winter months, however, tis the start of the cruising season for some and we have a select number of 40′ and 45′ boat slips available. Plus, we are also offering a Fun Facts Walking Tour and Sales Event on February 23rd for BoatUS (and by way of this message, also to Cruisersnet.net members) who are looking for a marina to call home port. We want boaters to know that New Bern is alive and well. 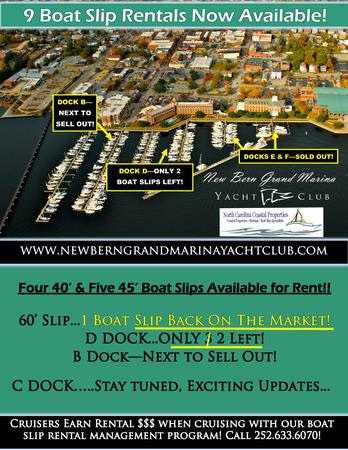 Renovations continue at the marina and New Bern and nearly all the local businesses and restaurants are open for business again, so cruise on in and attend this wonderful event! Please refer to the attached flyer and email me at Millissa@newberngrand.com to RSVP by February 13th. If the news was correct, the Double Tree hotel, and thus the facilities of the marina, will not be available for another year due to hurricane damage. No bathrooms, showers, or laundry. It's probably wise to tell people this to set expectations before they plan to stay there this summer. Due to Hurricane Florence the hotel is currently closed and will remain so for the duration of 2019. We will post updates to this page when a reopening date is identified.